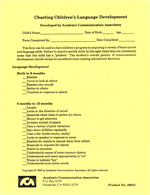 Speech and language skills are listed by developmental age from birth to age five on this handy easy-to-use form. The information is useful to parents and teachers in determining whether or not the child should be referred for a speech and language evaluation. You receive 30 copies of this valuable handout.